If you choose the CUSTOM option, please put your chosen color & Personalization in this box before going to Checkout. Any questions, please ask first! Thanks! 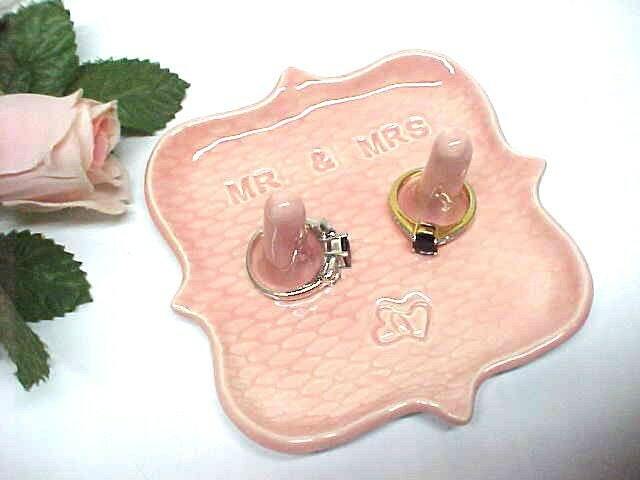 His & Hers jewelry storage dish. NOTICE: The Pink Blush dish is Ready to ship just as you see it! SIZE: Measures about 4 to 4 1/4 inches wide. Can be designed & personalized in many different ways. in mind. I enjoy making these special dishes! I cannot begin to tell you how happy I am with this artistic ring dish. The seller was attentive, kind, and professional. Turnaround time was unbelievable and the packaging was excellent. Thank you so much! The ring holder for my future sister in law turned out so cute!